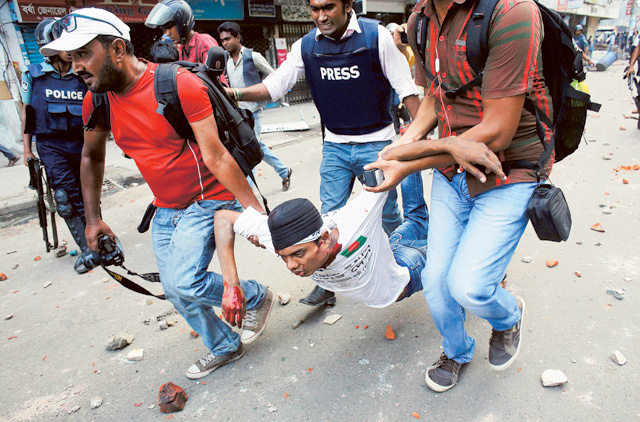 Dhaka: Violence gripped the Bangladesh capital as at least 100,000 Islamists enforced a blockade, cutting off Dhaka’s road links with the rest of the country while they fought a pitched battle, leaving at least one dead and scores injured. Activists from Hefajat-e-Islam marched through six highways, halting road transport between Dhaka and other cities and towns. Hefajat held the mass protest to push for a 13-point list of demands which includes a ban on men and women interacting freely in public and the restoration of pledges to Allah in the constitution. The newly created radical Islamist group is also calling for the death penalty for those who defame Islam and Prophet Mohammad [PBUH]. Witnesses said the Purana Paltan area in the heart of the capital and downtown Dhaka appeared to be the hardest hit when the activists armed with stones and crude bombs clashed with riot police who retaliated with rubber bullets and tear gas. “One transport worker was declared dead as he came under crossfire at Gulistan area [and] dozens of Hefajat activists and ordinary pedestrians are being treated for injuries,” a doctor at the state-run Dhaka Medical College Hospital told Gulf News. Police said several of their colleagues were also wounded as activists attacked them. Hefajat-e-Islam, which translates into ‘protectorate of Islam’, enforced the Dhaka siege to mount pressure on the moderate Awami League-led government to implement their 13-point demand. The group originally planned to lay a peaceful siege, allowing vehicle movement inside the city but they later decided to stage a rally at Motijheel area. Police granted them permission on condition that the rally would not turn violent. In a press conference on Friday, Prime Minister Shaikh Hasina urged the group to call off the their planned demonstration, saying that laws already existed to punish blasphemy. She also agreed to introduce tougher provisions in existing laws to punish those who humiliate Islam but urged the radicals to be considerate about the country’s moderate culture and heritage, saying these did not conflict with Islam’s teachings. The demonstrators planned to gather for a rally in the capital later on Sunday. Esmail Hussain, police chief at Tongi town, which links Dhaka with northern Bangladesh, said that “at least 100,000 Hefajat activists” had been blocking the main highway since dawn. Demonstrators also blocked highways at Jatrabari and Demra, cutting the city off from the north-east and south-east, including the main port city of Chittagong. The rally is the latest in a series of mass actions by Hefajat to increase pressure on the government to meet its demands. Last month, the activists organised a general strike and a gathering of hundreds of thousands of its activists in Dhaka, in what experts said was the largest political gathering in decades. Critics have branded Hefajat’s demands as a charter for turning Bangladesh into a country like the Taliban-ruled Afghanistan. Women workers, including female garment labourers, have vented their anger at the group’s call to segregate genders. Hefajat also wants Islamic education to be made mandatory in primary and secondary schools and restrictions placed on Christian missionaries. Hasina’s ruling Awami League has accused Hefajat, which draws its support from the country’s Islamic seminaries, of being a pawn of the opposition, which lent support for Sunday’s blockade. Hardline Islamist groups say Hasina’s government is trying to intimidate the opposition through a series of trials for war crimes allegedly committed during the 1971 war of independence. Three Islamists have so far been convicted and two of them were sentenced to death. At least 96 people have been killed during protests over the trials since January.